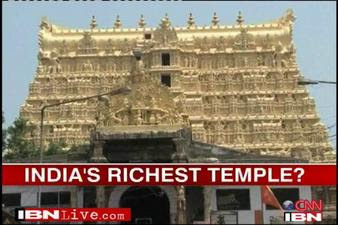 Treasure, thought to be worth billions of rupees, has been unearthed from secret underground chambers in "Sree Padmanabha Swamy Kshetram"
Yesterday the seven-member Supreme Court- appointed committee, which opened the chamber is learned to have added valuables worth Rs 20,000 crore into the inventory. 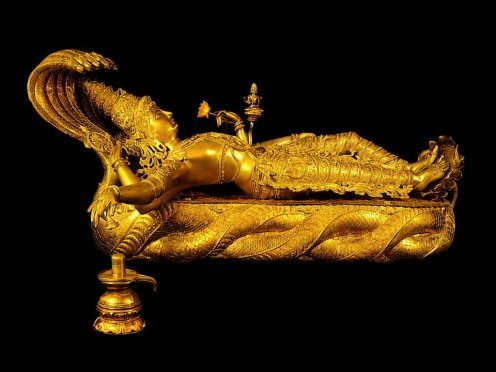 The treasure contains ‘Kashi necklaces’ worth several crores, believed to be worn by kings of Travancore.Crowns, jewels and precious stones were also listed.The seven-member committee, aided by Fire Force, Rescue Force and PWD officials, entered the underground chamber, armed with oxygen masks.Three sets of crowns and an idol of Padmanabha Swamy have been listed.A large collection of ‘Saratpoli mala’, numbering 1,000,was also found. They are studded with gems called ‘aval’. Nearly a tonne of ‘aval’ was found.One of these chains was reportedly 18-foot long.‘Swarna dhandu’ in huge numbers and ‘pathakam’ have also been listed in this chamber.The chamber was feared to be filled with poisonous fumes due to which it was oxygenated first. The members who entered the chamber were provided with oxygen masks. The committee has already opened the ‘C’, ‘D’ and ‘F’ chambers while the ‘E’ chamber could not be opened on Wednesday, as it required the presence of the ‘nambi’. This chamber and chamber ‘B’ on Today. The whole exercise began on Monday with the committee members opening the ‘C’ chamber which contained gold items, including golden umbrellas, pots,‘varps’ and silver pots. On Tuesday, the ‘D’ and ‘F’ chambers were opened.Precious stone-studded thrones and crowns have been found among the innumerable valuables stacked in these chambers. On Wednesday, the committee opened the ‘A’ chamber — which had not been opened for centuries — for a few minutes and decided to seek the help of Fire and Rescue Services personnel and Health Department officials to ward off any untoward incidents. The Sree Padmanabhaswamy temple was built in the 16th Century by the kings who ruled over the then kingdom of Travancore. Local legends say the Travancore kings sealed immense riches within the thick stone walls and vaults of the temple.Since Independence, the temple has been controlled by a trust run by the descendants of the Travancore royal family. After 1947 the kingdom of Travancore merged with the princely state of Cochin, which eventually became the present-day state of Kerala.The inspections at the temple began after India's Supreme Court appointed a seven-member panel to enter and assess the value of the objects stored in its cellars, including two chambers last thought to have been opened about 130 years ago. Padmanabhaswamy, which is an aspect of the Hindu God Vishnu in eternal sleep. This is why they historically entrusted their wealth to the temple.But there was a public outcry when the Maharajah attempted to retain control of the temple by citing the special law, with many arguing that the wealth belonged to the people now.The vaults were opened in the presence of the panel, and observers, which include high court judges, temple officials, archaeology authorities, Sundar Rajan and a representative of the current Maharajah. what they will do with this wealth? a beggar is the streets of temple will still have to beg the whole day for food..? Even i dont think its safe to keep it inside temple. As you know the area near the temple is heavily populated and it would be embarrassing to see security breached. Let us pray to the concerned to utilize the amount wisely as other religions are doing such as starting medical colleges, hospitals etc. etc. Couldn't this immense treasure be wisely used to create a foundation similar to the Bill & Melinda Gates foundation to eradicate poverty and misery in Kerala and even rest of India? Somehow I doubt if that'll happen. If I were the maharajah that's what I would push for. Praise the King for such a wonderful stock. The temple authorities deserve the custody of the treasure. Latest mode of security may be provided with Indian Military. Local police must be avoided as they may connive with anyone for his/their selfishness. It is our legal fundamental right to protect the temple sanctum and century old belief. Part of the wealth should be used for Charity under the authorization of the present Maharajah and the Royal Family and in the name of the temple. Weather we like it or not it is their ancestors who took the decision to safe guard and save this immense wealth. The government should make all measures for the smooth implementation of a Special Charity Project. They can use it for the upliftment of the poorest of the poor by providing them with the the necessary infrastructure in basic necessities, health and education for the future generations. The common man will be indebted to the Royal family for such a patronage in the is modern times. Part of the wealth including the special Historic valuables should be kept on exhibition in a newly built Ultra High Security Museum which uses the latest security technology available. It should be guarded by a special task force which specilizes in security... something like a special SWAT unit with good experience and well armed. This helps the would know of the previous history and glory of the land. This museum also should be managed by a panel comprising of the Royal family members, trusted temple authorities and the State Government. Part of the remaining wealth should remain at the source that is with the temple after the chambers are further fortified and made stronger in addition to security measures in the form of manpower and material. Sell it all....Its worth is meaningless unless used for the good of all... It belongs to The real treasures of India, its people. Invested in them it could eradicate hunger and poverty, create jobs, build homes, schools,roads, clean water plants etc. i observed a peculiarity in the anantha sayana idol...unlike the other idols of similar kinds in the country..here godess laxmi is missing near the foot of vishnu and one of the right upper limbs of the idol is hanging down wards towards the floor..i guess it may be an indication that the godess laxmi(wealth) is down in the cellar ..
look at the pathetic cooment of indian slaves who invoke waqll sgtreet journals and forbes and melllinfda gateslike capitalists i=to say that wealth of temple shoudl be used for poor while ignoring that the wealth of idnai sequestrated in swiss bank nbelong to indian poor aswell andtheyhave no itnewntion of bringing that. thse shmelss hindus donto even thinkt hat the treausre has emtotioanl and cultural value . will british monarch selltheir stoeln crown jewl to fund their health serivece? Every one knows what will happen if announced the treasure is to be utilised for public welfare.BEWARE.there is a long waiting list which will surpass the treasure amount.it will be god`s day out. wealth sud be used for decorating the lord only and nothing else... ters enough money in swizz banks to feed d whole india...... tat sud be brought back... if this wealth is used for public welfare ten the diamonds and malas will end up in some rich peoples house as antiques... just like kohinoor which is rotting in some old ladys hat!!!! 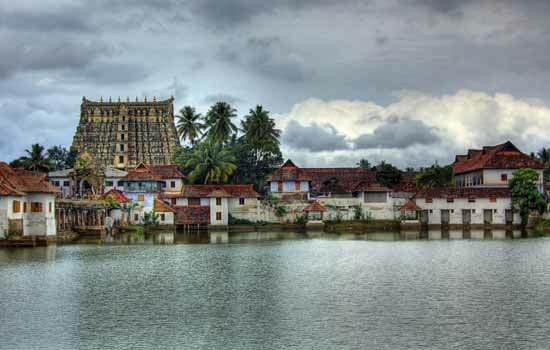 Would you like to get more visitors from Trivandrum? Submit your blog RSS url in http://zeole.com/trivandrum. This is a one time submission. This would automatically submit a preview of your latest blogpost in Madison with a link back to your blog.